Last weekend we decided to climb the rubble hill of Humboldthain to take a look at the remains of the Flak Towers that stand there among the trees, looking out across the city. I have been in this park many times, but for whatever reason I had never been up to look at the towers that were built between 1941-42 as part of the anti-aircraft defences of the city during the Allied bombing raids of the Second World War. The tower, that was designed to be bomb-proof, also provided an air-raid shelter for up to 15,000 civilians. The Flak Towers were destroyed by the French army after the war, leaving only the north wall and a couple of towers. 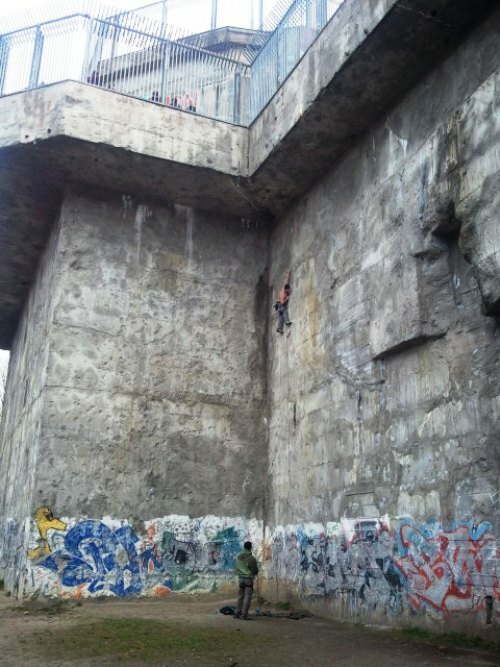 The Berlin Underworld Association, who have an office close to the park by the Gesundbrunnen station, have been running tours to the ruins since 2004. And as you can see from the pictures, the “North Wall” has become a popular climbing spot, with protection for sport climbers maintained by the German Alpine Association. On the weekend we watched as four different pairs climbed the different routes, and enjoyed the sight of surprised visitors waiting for their tour of the ruins at the top of the towers as they saw the hands and then the face of the climbers appear on the “wrong” side of the fence. It must be frustrating to be a climber based in Berlin, surrounded by incredibly flat countryside. But watching them climb the flak tower reminded me that you can always make the best of your situation, whether it is walking, climbing or, like the guys catching a wave down in Munich, surfing despite being hundreds of kilometres from the sea. This entry was posted in Diary, Places on April 18, 2012 by Paul Scraton.